There is a special shelf at our local library devoted to books about particular or difficult topics for children – death, illness, adoption, new siblings and so forth. In many instances, it is easier for parents to begin talking to their children about sensitive issues with a story book in hand. Two Birthday Cakes deals with the issue of parents separating. 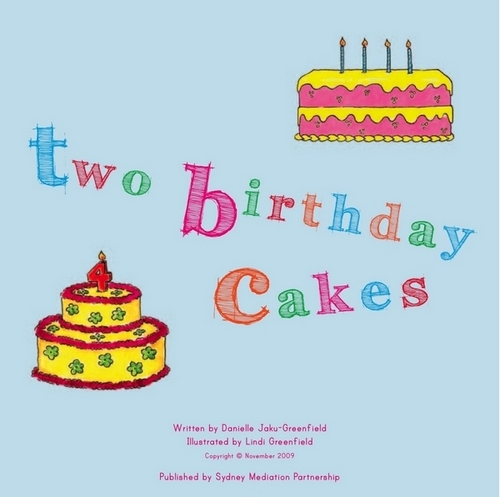 Written by family law expert Danielle Jaku-Greenfield, Two Birthday Cakes is an illustrated self-help book for children experiencing separation and divorce. It also covers parents meeting new partners, mediation and highlights amicable and not-so-happy arrangements – “My friend Alex hasn’t seen much of his Daddy since his parents moved into two homes“. Andrew Greenfield, Child & Educational Psychologist says “‘Two Birthday Cakes is a beautifully illustrated, self-help colouring in book that would certainly be a valuable resource for parents, teachers and allied health professionals in informing children about separation and divorce. The book is written in clear, easy to understand language and is based on real stories from real families that have had to deal with the sometimes confronting issue of separation”. Two Birthday Cakes is the first in a series of books. It is available from the Sydney Mediation Partnership and costs $19.99. We attended the launch yesterday in Sydney, and we’re sure it’s going to be a terrific resource for parents and children dealing with divorce. We look forward to reading the next book in the series.